I took a sabbatical in November and set out to learn some game development. It’s been a month-and-change since I wrapped up, and now I’m looking back to reflect on my endeavor. My auto-response while I was out. Stack Overflow gives employees 4 weeks of paid vacation on their 5th anniversary, and an additional week each subsequent year — up to a maximum of 8 accumulated weeks. It’s the same as regular vacation in terms of scheduling, pay, and whatnot except that you must take a minimum of a month off at a time. It was a big year for sabbaticals at Stack Overflow; 13 people took them in 2018. Before taking the time off, I knew I’d need a project to keep me entertained, and I decided I’d play with a kind of coding I’d never really done before — game development. 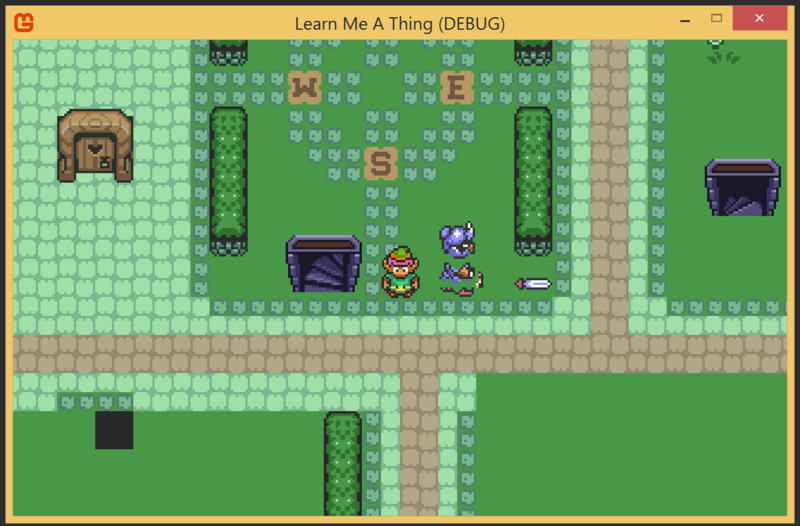 I built the very beginning of a A Link To The Past pseudo-clone, working from first principles. Besides actually blitting pixels onto the screen, I built everything: loading assets, collision detection, animations, room transitions, etc. In the end I had a game with one real room, a working enemy, a few interactable objects (doors, bushes, walls, and pits), support for room transitions, and a lot of half-way decent infrastructure. Sprites, animations, hitmaps, and room backgrounds can all be edited while the game is running and they’ll be automatically reloaded. This made me way more productive when it came to “creating” assets (i.e. chopping up LTTP screenshots and stitching them together). For a real game, I would have built a bunch of tools for creating and previewing things, but hot reloads felt like a clever and cheap alternative given my limited time. I did sprites on the 2nd day (which implicitly handled hit maps), rooms on the 7th, and animations on the 8th. I spent most of my time in DEBUG builds since I was, well, building and debugging. Accordingly, I felt I had to keep DEBUG performance decent enough to actually run the full game. Since wrapping up, I’ve come across discussions suggesting that some actual game devs share this sentiment, which is a nice bit of validation. Of course, they may not be representative of the game industry as a whole, but at least I’m not alone in my craziness. I spent time explicitly working on DEBUG performance on the 14th and 15th. I had never worked with the Entity-Component-System pattern, but found that it did a really good job of keeping code separated in a sensible way. For example, both the knights and the player can cut bushes… but neither of those entities have any knowledge of the other. Generally, things “just worked” without nasty code. I also kept rendering unaware of the rest of the game, which feels like an accomplishment. I implemented overlays for sprite bounds, collision bounds, collision polygons, sub-system timings, and render timings (including FPS). These were crazy useful for debugging, and frankly I should have worked on them even earlier than I did. I implemented these overlays on the 12th, 13th, 14th, and 28th. What didn’t I get to? Right now the sword knight, as the only enemy, handles its own death animations, which is less than ideal. Guarantee of stability, so no matter where the code is running random numbers will be the same. In the same vein, parallelism requires some changes so that random numbers are consistent in a frame even if the actual code runs at different times. There’s a lot of fun to be had with manipulating RNGs in old games (check out the Luck Manipulation TAS videos), so a custom seeding paired with a simple algorithm can actually be a plus. I kept the rendering code and logic code separate, in part to enable this, but never got around to it. I captured all the GIFs in my posts with ScreenToGif. In a number of systems there’s a “glue” function that repositions various entities based on current animation frames, which is not great. These relative positions shouldn’t be in code as constants, they should be loaded up as part of an asset. I mulled over the problem for a while, but couldn’t come up with a nice generic solution… maybe there’s something in the literature I’m unaware of, or maybe I’ve structured my entities and animations poorly. I mentioned this on the 16th, and it only got worse as time went on. Besides lack of time, my biggest worry was that I’d build something that wasn’t portable outside of my machine — always a risk when tweaking builds. It was an interesting exercise, and I’m not convinced that it couldn’t be done well, but I spent a lot of time on it for little gain. I read an interesting write up on using rational numbers in 3D rendering, which reinforced my interest in less traditional math options. I also had to spend a lot of time optimizing this code since, especially in DEBUG builds, it was thousands of times slower than just using floats. I assumed that test would cover most of the same ground, which turned out to be false. A few days were lost because I hadn’t anticipated the need for debug overlays, making debugging a lot harder than it should have been. Overall, I have few regrets, which feels indicative of a month well spent. That said, if and when I continue working on this codebase, I’m sure I’ll find more things to regret. I spent time on this during the 3rd – 7th, 9th – 11th, 13th, & 16th. This totals about 33% of my time over the entire sabbatical. This isn’t well accounted for in the actual posts, but most days I spent an hour or so doing something with assets. Oftentimes this was just scaling and making minor edits, but sometimes it was painstaking screenshot comparisons to figure out relative positioning between two separate assets. As a rough estimate, I spent about 12% of my time on this task. Primarily overlays, as documented in the 11th – 13th. A lot of ToString() implementations to make life easier in the debugger. This was probably also about 8% of my time. Everything else took the remaining 40-50% of my time, which feels about right. Since I was mostly working on building up the infrastructure of a proper game, I don’t think spending half of my time on plumbing was a problem. Now, if I had spent a year or two on this project, that division of time would be problematic — I’d expect more time to be spent on the actual “game” part as development progressed. I’d like to, which is a weaselly answer. The value of uninterrupted time to devote to development is hard to overstate, and if I continue I won’t have that. So I couldn’t expect to be nearly as productive, which makes the whole thing less attractive — I’m one of those people who derives a lot of enjoyment from making tangible progress. All that said, I’m going to try and spend a weekend every now and then plugging away at the LearnMeAThing codebase. I may even keep notes and blog about it occasionally. I can’t exactly publish the whole project, since it’s full of Link To The Past derived assets. I’m also not all that interested in really open sourcing it, because it’s a learning project for me I wouldn’t accept pull requests or handle issues. That said, I like the idea of folks learning from my examples-and-or-mistakes: so I put together a GPLv3 one-time dump of just the code. Family was in town on the first, I got nothing done. But I did get a bonus day on the 2nd! Logically, the knight knows how to chase the player now… there are some issues, however. Just have to spend some time debugging here, then I’ll get to the user actually taking damage and recoiling. The knight can now stab players, and it knocks the player away. As with other damage-y things, the player system is not actually aware of the knight or it’s sword – it is just informed that it was struck by something with the DealsDamage component attached to it. Last task for the sabbatical, make the knight die when it’s hit by the player’s sword. The sword knight can die! And with that, my sabbatical is ended. I intend to write up a retrospective at a later date, but all in all I’m pretty happy with my progress and I learned a lot. Definitely ready to get back to work and see all my Stack Overflow people again though, a month of not working is quite enough. It’s my last official day of sabbatical! I’m still planning to do a retrospective post, and have the weekend to maybe do some extra-sabbatical work. But today, I’m hoping to finish up the sword knight. I’ve got some smarter state management on the knight, it will no longer wander too far away from its origin, and have made the sword sharp. Now, when it’s in motion, it will “do damage” to anything it comes into contact with that can receive damage. Right now bushes are the only things take take damage, so the knight is limited to cutting them. This is, again, emergent behavior – neither the knight’s code nor the bush’s code knows about the other and the collision system is completely ignorant of damage. I continue to be impressed with the Entity-Component-System design pattern, which made this structuring pretty painless. Now to get the knight to see (and subsequently chase) the player. Well, I didn’t quite get to chasing… but the knight can see things now. I modeled is vision as an invisible, but still hitable, box – so it’s just a matter of adding a reaction to the player colliding with it. Turning on one of the debug layers lets us see the vision cones in action. I’ve got a little bit of cleanup to knock out before getting to implementing an enemy, and I want to get allocated bytes and some GC states into a debug overlay. So I’m going to do that real quick. Humorously, I did find a couple leaks with this new GC reporting – and most of them were in the “render this debug layer”-code. I did also find a bug with returning FrameState’s to a reused pool, and fixed it. There’s a more complicated issue around delayed loading of some types & delegates, in particular those around collision detection, which can cause some collections after reaching the stable state. I could go and fix those, but they’re a fixed cost and frankly I want to get started on an enemy. I’ve decided I’m going to implement a sword knight, my first enemy and probably my last task for this sabbatical. I’ve got falling down a pit mostly working, but I want to add a little drop shadow to show where the player is falling. This will be the first exit transition that creates an entity, so that’ll be interesting. Again, I’m not gonna win any animation awards – but it works. I think my final task for this sabbatical month is going to be to implement an actual enemy to fight, but before I do that there’s one more piece of infrastructure I want to build: a “job system”. Pretty much everything that matters has multiple cores now, and it’s kind of silly not to take advantage of them – but multi-threading has some complications in the context of a game. Whereas a web app can assign threads to different logical requests, games have a single logical process. Unlike web apps where all threads are more or less equal, games typically have a privileged thread (the UI thread). And since this whole endeavor is a learning exercise, I think I should play around within these constraints. JobRunner is pre-sized for a set of threads, and a maximum number of concurrent jobs. Other code will use a single JobRunner to pre-allocate Job’s based on a delegate, and whatever additional state they need (the current GameState will always be passed, as it should always be needed). JobsCompletionToken is returned by the JobRunner.StartJobs method, wraps around whatever IJobs are passed, and has a WaitForCompletionMethod(). The basic idea is that JobRunner pre-allocates threads and JobCompletionTokens, various bits of code create their Job’s when they’re spun up, those Job’s (as IJobs) are re-used to run the code but with an updated GameState. I built it using the standard Thread, Monitor, and Interlocked classes. Threads do the actual work (the main thread is never stolen), the Interlocked class is used to add and remove IJobs and JobsCompletionTokens from queues, and Monitor is used to pause and resume threads. Since everything is pre-allocated, once startup is done this runs with no allocations. 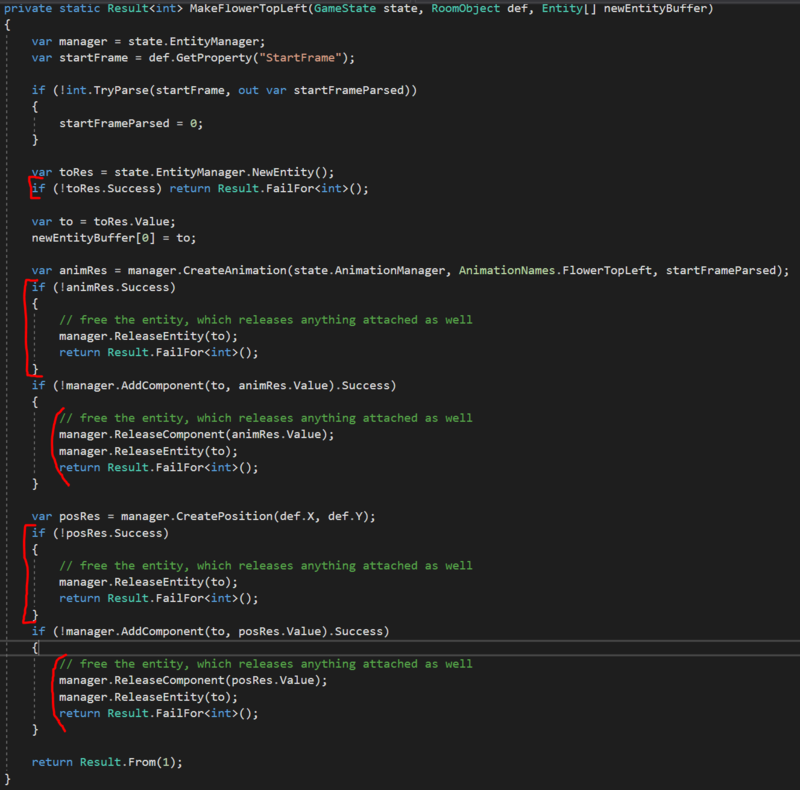 Multithreaded code is difficult, and I’m not convinced I got this correct (though I did write tests). It’s also difficult to describe, so I’m just going to link to it: JobRunner, Job, and JobsCompletionToken. Now to actually use it. It’s the end of the day and I’ve converted two systems to use the JobRunner: the CollisionDetectionSystem, and the UpdatePositionSystem. Both of these were doing four passes of the same logical step, one for each level of a room. If you squint you can see some small improvements in DEBUG, although they’re mostly washed out in RELEASE builds. The multi-threading for the collision system is probably too coarse, honestly, since most everything is on one level. Regardless, I feel this exercise was a good one. Tomorrow I’ll start on a proper enemy. It’s the start of the final week of my sabbatical. I’m still deep in the “move components to an object pool”-branch this morning, but I expect to finish up soon. While I’m in here, I’m also reducing some repetitive passing of new Ids and trying to make the ObjectCreator class (which is responsible for creating room objects at room load time, swords when the player starts swinging, etc.) exhaustively testable. I’ve finished getting components moved into object pools. As I said earlier, I also added some tests that verify that nothing gets leaked if an error occurs during “object”-creation – where anything is a Component, or an Entity. When I first implemented those tests, I found I was actually leaking all over the place in failure cases. The causes were a mix of not accounting for errors at all, and forgetting to free components that I failed to attach to an entity. To make those tests, rather than mock the entire EntityManager I added some bookkeeping that tracked how many “fallible calls” happened and added a switch to force failure after so many of those calls. Then it was just a matter of determining how many calls each sort of object needed, and then failing at N calls, N-1 calls, N-2 calls, and so on. A few objects (like the player) were created via different code paths, so I moved those to the ObjectCreator class and added tests specifically for them (since they aren’t defined via room templates). As you can see, it’s north of 50% of the code. The whole ObjectCreator class went from 330 lines when I wasn’t doing things correctly, to 1,498 lines at present with all tests passing. While I am tempted to spend some time shaving this yak, reducing the boilerplate, I think it’s best to move on to the final exit type. Falling through pits is half-working. New animations and yet-more-complications of the ExitSystem have gotten me to “falling into a pit”, “spawning a new room”, “fading the old out”, and “falling from the ceiling”. As you can see, there’s still some jank to it. The camera jumps around a bit, and the animations aren’t quite incorrect. While the player doesn’t appear to be in the pit during the first half of the transition, this is actually correct – pits in the game have surrounding assets that extend the black a bit, and accordingly the player’s falling sprites are bigger than the true pit tile. I have been able to reuse a lot of the infrastructure I built up for the other exits (things like fading and explicit camera control) which is nice, but I’m still not super pleased with the code. Even before fixing the last few things with pits the ExitSystem has 3 separate code paths, 14 different state variables, and totals more than 1,000 lines of code. I doubt I’ll get around to cleaning it up during my sabbatical, since it’s so close to ending, but if I continue this project I’ll definitely want to revisit the ExitSystem once it’s feature complete.